This gallery presents pictures I took while on a Tauck river cruise from Amsterdam to Antwerp in April 2016. While in Amsterdam, we visited the Keukenhof Gardens. The gardens feature 7 million bulbs that bloom over about 2.5 months on the garden's 70 acres. We then traveled to Dordrecht, a historic city that borders 5 rivers. While there we visited Kinderdijk, a UNESCO world heritage site that features 19 original 18th century windmills that are still in operation. 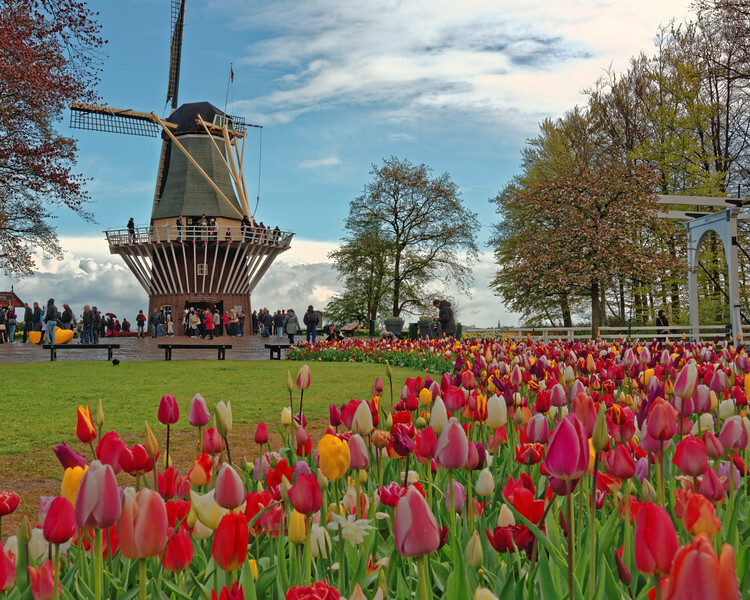 Because Holland is below sea level, the windmills pump out water to produce dry land or keep it dry. Each mill pumps the water up a meter or so, and the next mill pumps it, and so forth, until the water is pumped over a dike into a canal or river. The windmill blades can be rotated so they face the wind. "Millers" live in each of the windmills.